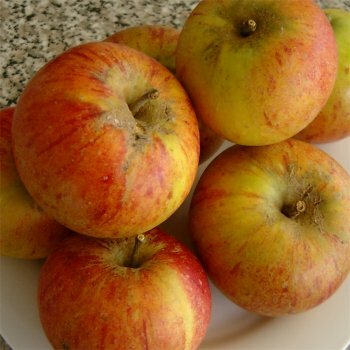 The Apple Coxs Orange Pippin is ones of the UK's favouites. A very popular apple with sweet, crisp, aromatic and juicy flesh the Cox is often seen on supermarket shelves. Introduced in 1825 this apple can be temperamental and isn't suited to Northern areas. A more resilient and equally as tasty alternative is the Apple Sunset or the much more accommodating Cox's self fertile variety. Cox's Orange Pippin is in pollination group B and requires a suitable pollinator within a 1/2 mile radius. Apple trees should be spaced according to their rootstock, for example an MM106 (semi-vigorous) rootstock will require approx. 4.5 metres between trees, whereas an M27 (very dwarf) rootstock will require approx. 1.5 metres between trees.